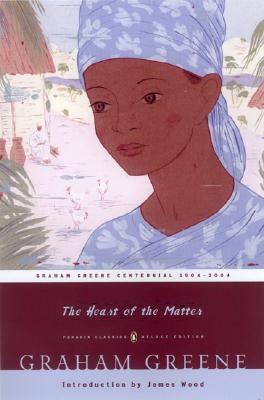 “Wilson sat on the balcony of the Bedford Hotel with his bald pink knees thrust against the ironwork..."
Graham Greene's masterpiece, The Heart of the Matter, tells the story of a good man enmeshed in love, intrigue, and evil in a West African coastal town. Scobie is bound by strict integrity to his role as assistant police commissioner and by severe responsibility to his wife, Louise, for whom he cares with a fatal pity. When Scobie falls in love with the young widow Helen, he finds vital passion again yielding to pity, integrity giving way to deceit and dishonor—a vortex leading directly to murder. As Scobie's world crumbles, his personal crisis develops the foundation of a story by turns suspenseful, fascinating, and, finally, tragic. Originally published in 1948, The Heart of the Matter is the unforgettable portrait of one man—flawed yet heroic, destroyed and redeemed by a terrible conflict of passion and faith. This Penguin Deluxe Edition features an introduction by James Wood. James Wood is a staff writer at The New Yorker, a visiting lecturer at Harvard, and the author of the national bestseller How Fiction Works and the novel The Book Against God. He lives in Cambridge, Massachusetts.